4 days to go! Exploring new countries and cultures is one of my favourite things about travel, so today I'm going to help you learn how to get the best from your road trip experiences! First off- here are 6 Bizarre European traditions to whet your appetite, as well as some tips to make the most of your cultural experience! Throwing pottery out of windows! There are different rules and traditions in every culture- and you'll be much less likely to cause offence if you know what they are in advance. For example, did you know in Romania they whip women with willow branches on Easter Monday to promote fertility?? And in Scotland in some parts they still ‘blacken the bride‘ by pouring disgusting and horrible things over the happy couple to ensure they can withstand humiliations together. Fun, huh?!? If you came across either of these things without knowing about it, you'd probably call the police! But if you've done your research, at least you'll know what you're looking at- even if you do disagree with it completely! Talking of weird Easter traditions- most of Germany bans dancing, in any and all forms, on Good Friday. So don't go twerking in the streets! 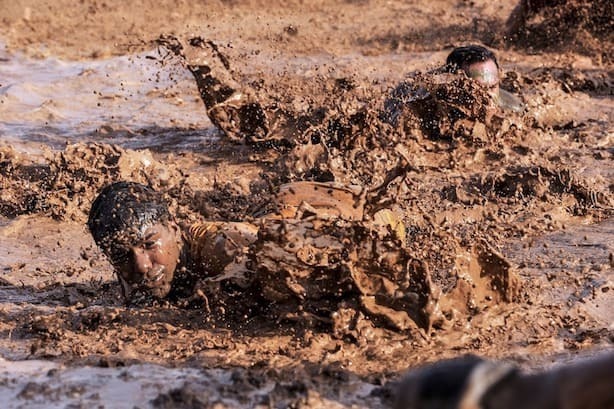 In Germany, they host the Mud Olympics- it's been running since 1978! In Dinant, Belguim, they race bathtubs down a river every year on the 15th August. The course is 1Km long and the race attracts more than 25,000 people each year!! I've tried like crazy to find a photo with permissions to share… but alas! They're obviously too busy trying not to sink instead of taking photos!! In Finland, every year there is a wife carrying competition- which is exactly as it sounds. Every year in the UK, on the last Bank Holiday Monday in May, at a hill called Cooper's Hill in Gloucestershire, you will see…. well, to be honest you'll see utter carnage. For over 200 years, people have been racing down a ridiculously steep slope… there are literally people at the bottom to stop the competitors rolling further down the hill. You can just turn up on a day and enter… but be warned- people break their arms, legs and necks on a terrifyingly regular basis! There is a cheese for each race (produced specially by a local cheese maker) which is rolled down the hill in front of the competitors and they race/ tumble down the hill trying to catch it… you know what- this tradition is too bizarre to explain. Watch the video…. Oh yes- Spain knows how to party! Every year they hold a tomato throwing festival, normally in August. It takes place in Buñol, which is near Valencia, Spain. Over 120 tonnes of tomatoes get thrown- it gets very, very messy! For over 18s only and only up to 22,000 participants are allowed. If you want to buy tickets, their website is here. Are you ready to do battle?? Apparently Manchester, UK have started to do a smaller version of the festival… not entirely sure why! I feel so sorry for the people who have to clean it all up afterwards!! Be careful if you ever visit Corfu at Easter. Every Easter Saturday, at 11am precisely, the locals start throwing pottery out of their windows to smash onto the street below. It apparently stems from a New Year's Eve tradition of clearing the house for the New Year. (TOP TIP- fill the pottery with water first for an extra big ‘smash'! Ok- so after all that, let's get to some actual road trip tips!! We try to write these down and keep them handy as we travel, or use ones on Pinterest like this one. We used to use a couple of great apps as we travel to help us translate things, but these have now all been bought out by Google. Luckily, the Google translate app is brilliant, so we recommend downloading that to help translate text or voice as you travel. I found this post on Google– it made me giggle at how our lovely American cousins view our European weirdness! 🙂 For my American readers, I hope it gives you a quick insight into European culture- even the bizarre bits!